The STABILO access mats are extremely resistant HDPE panels, particularly useful in muddy or slippery soil conditions since they can be placed on the ground in order to allow motor vehicles and pedestrians safe transit. The panels are manufactured to the highest standard, using superior – strong HDPE that makes them both strong and slightly flexible in order not to break, moreover a special UV additive protects them from deterioration due to sun exposure. 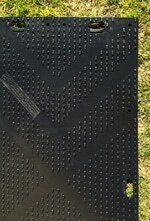 By placing the access mats one after the other and fixing them with the apposite joiners, it is possible to create a portable roadway or an anti-slip temporary flooring for working yards. 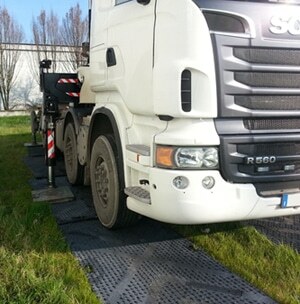 The mats protect the expensive turf of your customers – avoiding rutting, soil compaction, and other damages – avoid possible expensive operations for dislodging vehicles and equipment from mud, prevent from potential injuries to workers and help reducing wear that usually increase in vehicles working on unstable and harsh ground conditions. Each mat measures cm 120 x cm 240 x cm 1,2 and has a tread pattern on both sides that provides additional mat traction on the ground. Sections are reversible and can be used with either side face up. The STABILO access mats create an instant roadway over virtually any type of terrain such as grass, sand, gravel, mud, marshy or uneven soil, snow and even on gently sloping areas. They can handle loads up to 80 Tons, depending on the subsurface quality and consistency. For most grass lawns for example, it is possible to comfortably move tractor trailers, cranes, forklifts, and other equipment of up to 80 Ton. Each unit weights 35 Kg and can be easily carried even from one single person, thanks to strategically positioned handholds. 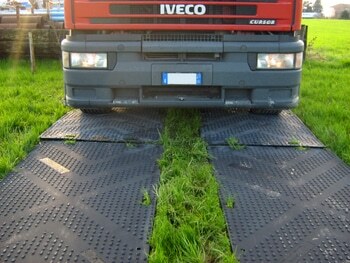 Use: The mats are designed to be used over: grass, gravel, mud, sand and other difficult soils.